NCAD Gallery supports contemporary practice and critical debate in the visual arts and is part of the National College of Art & Design, Dublin. National College of Art and Design, 100 Thomas Street, Dublin D08 K521, Ireland. Exhibition Opening times Please check the website individual exhibition timetables here. Admission is Free. 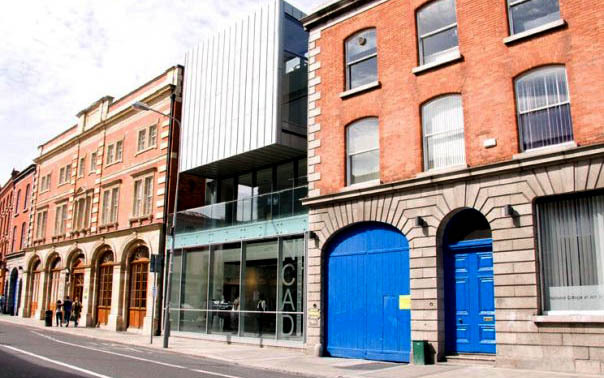 Established in 2009, the NCAD Gallery is the public face of the National College of Art and Design, Dublin (NCAD). The NCAD Gallery, in accordance with the College’s agreement with Dublin City Council, operates as a public venue as well as a College Gallery. The Gallery supports contemporary practice and critical debate in disciplines of art and design, and aims to reflect the diversity and strengths of the College through the continual development and promotion of its exhibition and education programme. The Gallery affords an opportunity for invited practitioners, curators and writers, students and staff to experiment with, develop and publicly present their work; providing a space for research and debate within the context of contemporary practice in the immediate environment of the NCAD, engaging the wider visual arts sector and public audiences. Through collaboration and in partnering with a wide range of organisations and institutions in Ireland and further afield, its expansive visual arts programme of exhibition, projects, performance, workshops and events play a central role in developing local, national and international connections. The NCAD Gallery exhibits a curated public programme selected by the NCAD Gallery Committee, by invitation or through advertised 'open call' opportunities. Practitioners may also submit a proposal at any time throughout the year. The Committee’s membership includes: the NCAD Director, the NCAD Faculty Staff and the NCAD Gallery Programme Curator. Proposals may be made by individuals or groups and should address the nature of the Gallery space and its context in the College, the city and the art and design sector. The programme curator is available to advise prospective exhibitors in advance of finalising a proposal by contacting gallery@staff.ncad.ie. All NCAD Gallery exhibition and project proposals are submitted to the NCAD Gallery Committee for formal review and sanctioning. The NCAD Gallery supports practitioner and organisation funding applications only after a proposal has been successfully reviewed by the Gallery Committee. Funding applications are reviewed and made in collaboration with the gallery programme curator. All NCAD Gallery exhibition & gallery publications are managed and produced by the NCAD Gallery staff as official published documents of the National College of Art and Design, Dublin. As official College documents publications are produced to a professional standard in accordance with College/Gallery procedure and procurement guidelines - all invited persons to produce written textual information, essays, review essays or any documentation for Gallery publications/ documents are managed and sanctioned by the NCAD Gallery staff. All requests for permissions for use of exhibition images and written material for inclusion in print or online documents are managed and sanctioned by the NCAD Gallery staff - this includes all images and texts published for any domain as recommended above in this paragraph. All further query may be directed to the NCAD Gallery Programme Curator, Anne Kelly at gallery@staff.ncad.ie. Image credit: Artist Sarah Pierce performs at the NCAD Gallery on the opening night of the exhibition collaboration with the Black Church Print Studio, Pull Bite Rally, 2014, curated by Anne Kelly. Photography: NCAD Gallery, 2014.